What kind of a Europe do we want? Surely one that values solidarity. The German course of austerity therapy has failed. It is time to correct the mistakes. BERLIN taz | „Politics begins with the contemplation of reality.“ Since the Greek 'no’ there have been so many lies flying around the German political landscape that one wants remind the top-ranking German politicians and leading spin doctors of that famous quote by Social Democrat Kurt Schumacher. Ah yes, reality. It is currently being negated by many, and unscrupulously reinterpreted by others. So much so that the prejudice within the German discourse could gain the upper hand. That, however, must not be allowed. The result of the Greek referendum is not, as the Bild-Zeitung imagines it, a simple rejection of the euro. With his policies, Prime Minister Alexis Tsipras has not „burnt the last bridges“ towards compromise as SPD leader Sigmar Gabriel maintains, nor has Tsipras’ government lit a wildfire in Europe, as CSU General Secretary Andreas Scheuer claimed, before he went on to rail against „leftist wrong-way drivers“, „blackmailers“ and „deceivers of the people“. Reality? You must be joking. This is what propaganda looks like – instrumentalising reality to one’s own ends. That kind of incitement has nothing to do with rationality, let alone respect for other cultures or democratic conventions. The question on the ballot papers was precisely formulated; it referred to the most recent austerity measures offered by the EU institutions – and nothing more. At the same time, surveys showed that a large majority of Greeks want to stay in the eurozone. In real terms: around 60 percent of all Greeks, in particular many young people, are calling for a stop to the brutal austerity measures. Some 40 percent of all citizens would even be prepared to accept further hardships, despite rampant poverty. Dieser Beitrag ist die Übersetzung eines Essays von Ulrich Schulte zum griechischen Referendum. Deutschsprachige Version. The debt-ridden country is therefore not as torn as it would appear. The Greek 'no’ is in fact a committed ‚yes’. The majority want a Europe of solidarity, one that joins forces for the weak and leaves nobody behind. A Europe that does not cowtow to the euro, the stock exchange and the market, but one that champions the primacy of politics, fellowship and integration. To ask the careful question: don’t we all want that? Moreover, isn’t such a vision of a bountiful alliance worth a couple of billion euros? Those who interpret this complex, conflicted situation as a vote for leaving the euro are acting irresponsibly – and in essence apolitically. One has grown accustomed to the CSU top dogs’ dulled reactions to anything happening beyond the Bavarian border, as if they had poured five Weißbier down their gullets at breakfast time. However, it is apalling to see the SPD chairman stoop to courting prejudice in order to clutch at percentage points. In the matter of the Greek question, the German Social Democrats have denied their very essence which, despite Agenda 2010, should have something to do with social warmth and international solidarity. Whether Sigmar Gabriel’s right-leaning approach can still win points with fearful voters remains to be seen. That the damage done to the party image will remain is clear. However, given the drama of the process, one could almost begin to no longer care about the SPD again. What kind of strange understanding of democracy is this anyway – to label a referendum on harsh austerity measures a trick, or an attempt to blackmail the EU? Chancellor Angela Merkel, Gabriel and the CSU leaders are otherwise constantly lauding the idea that the people must be allowed to speak their voice strongly. It is precisely in such European questions that more participation is drastically needed. Many harbour the prejudice that Brussels is a bureaucracy-obsessed Moloch, wholly detached from everyday life. When the government of an EU state allows its citizens to vote though, the same parties act as if it were a coup against the European idea. To actually implement direct democracy – what are these cheeky devils thinking?! The charming thing about the at times aimlessly wandering Syriza government is that it lays well-practiced rituals bare. With the referendum, Tsipras broke with prevailing EU logic. The troika had always negotiated on restrictions with only a few of those involved in the governments – at the exclusion of the parliament, not in sought-after backroom deals, and with criteria that almost nobody understood. The pressure that they exerted, the lack of reality in some of their austerity plans and the leverage enacted on parliamentary rights only came to broad public knowledge with the Greek crisis. One must be grateful to Tsipras’ left-wing government for this act of transparency. Behind the plumes of the smoke grenades being thrown by all those involved, what is being missed is that two policy approaches are colliding. The EU institutions, the German government and the other EU member states are adhering to the dictum that in order for an economy to grow, its markets need only be set up liberally enough. Tsipras and Co. are pushing for a Keynesian investment policy, and debt relief. Many hard facts now suggest that Germany’s approach to Greece is not working. In recent years, Greece has cut its budgets by more than 30 percent. Its economy has shrunk by almost a third, unemployment has shot up to 27 percent. With a deep recession and excessive debt occuring side by side, the German chancellor must have long since realised that her austerity dictum is misguided. The consideration of reality, however, has certainly not begun within the SPD – its chairman preferring to grumble that German workers’ incomes would be jeopardised by a permanently subsidised Greece. That's true, but it is too simple. Gabriel neglects to mention that an exit from the euro – the notorious Grexit – would be even more expensive. Germany would have to immediately write off sums in the high-double-digit billions, and Europe would create a poorhouse on its doorstep. The worst, though, would be the disintegration that that would signal. Europe would no longer be a strong economy, upholding fundamental common values, but rather a power team geared for a competition in which underachievers are mercilessly left behind. Granted, it is understandable that Europe's political elites are vexed by the behavior of the newcomers from Athens. Tsipras and his finance minister have used every opportunity to discredit themselves. Anger, resentment and frustration are simply not political categories. It is simply not very helpful when the negotiating parties make accusations of criminality and terrorism. Similarly, it is incomprehensible why a leftist government would resist cuts to their inflated military budget for so long. The nationalistic connotations in the pathos which Tsipras confers upon his own work are also pretty hard to bear. But anger, resentment and frustration are simply not political categories. They lead nowhere. Good politics are characterised by the fact that they do not yield to emotional temptations. The German federal government would be well advised to seek out the rational core and reevaluate, again and again. Particularly as the Germans are very powerful players in this poker game, and the Greeks very weak ones. Those in positions of power who kick those below them always come across as vile. Gabriel and Scheuer ought not to forget that. By contrast, the rationality of Tsipras‘ actions has been downright impressive. By replacing his finance minister he removed the most provocative player from the game. The other EU ministers would no longer have even sat at the same table as Yanis Varoufakis, with his successor they will have to. With simple matters of staff, Tsipras demonstrates his bargaining skills, placing the EU institutions in a tight position – and the European Union? In the face of this situation the other EU countries, Germany in particular, cannot permit themselves to persist with their face-saving posturing. Taking democracy seriously means offering Greece new negotiations. The German chancellor is reputedly able to learn quickly. That was always her greatest strength when it came to nuclear power, the minimum wage or family policy. So far Angela Merkel has attempted to solve the European crisis in a very German manner. She has set everything on the peculiar and, for the vast majority of peoples, entirely incomprehensible ideology that tough austerity is a national economic panacea. She favours infinitesimally small steps and dogged negotiating, as in the case between employers and industrial union IG Metall. She is also confident that the weakest will emerge from such struggles in the lead. Europe isn't that German. As ironic as it sounds, with their ‚no‘ to austerity the Greeks have given Merkel the chance to correct her mistakes. Helmut Kohl, who still stood for the true idea of Europe, would have most likely signed off on Greek debt relief years ago. "Greece has not met a single commitment." It's a statement without facts behind it. As far as I know, it's the first debt crisis in Greece and not something we've seen recurring every three decades or so. The terms of the deal of 1953 are important, because they made the German repayments dependent from its revenues. So it's not only the matter of fairness but also of economic common sense. The article is rather long and meandering. I have picked out a few points I think worthy of comment. The Euro mess is a prime example of the „primacy of politics.” How can the author be so naïve as to use the phrase without embarrassment? The economic measures advocated by the Troika and Germany were working, until Syriza took over. (Source “Das Hilfsprogramm funktionierte – bis Syriza kam” FAZ, 4. Juli 2015.) 5 years ago, one referred to the “PIGS” (Portugal, Ireland, Italy, Greece, and Spain). Policies of fiscal discipline worked in every country but Greece. All of these countries except Greece can now easily finance themselves using the bond markets. The Greek crisis has not changed that. “Europe would no longer be a strong economy, upholding fundamental common values.” On the contrary, if Europe upholds agreed upon rules, it will be a very strong economy indeed. Finally, a “vision of a bountiful alliance” is not worth a couple of billion euros. (Such a vision can be had for the cost of a single joint.) I think most Europeans want a Europe of rules, of limited (not boundless) solidarity, and good governance, such as practiced in the countries of Northern Europe. "Helmut Kohl, who still stood for the true idea of Europe, would have most likely signed off on Greek debt relief years ago." Daer Mr. Schulte. Democracy means responsibility!!!!! And the Greeks have been totally irresponsible - for the last 40 years. Germany and Angela Merkel have been, are, and remain responsible. I think you are rather confused - at least your report is very confused. The saying is "Bock zum Gärtner machen." You have done a grand job of that. So tell me please, is forgetfulness and lack of repaid solidarity nowadays a virtue?
" forgetfulness and lack of repaid solidarity nowadays a virtue?" West Germany has since 1953(and since 1989 united Germany) met every commitment made. Greece has not met a single commitment. Already from 1945 until 1953 West Germany showed what they were prepared to do to rebuild. That was also an important precondition for wiping out debt. West Germany proved it was responsible and capable of doing what it commited to. We are not talking about an ideal world - as much as left wing "radicals" think we are. We are talking about responsibility, commitments and trust based on meeting exactly that. And Germany was and is prepared to provide a lot of money to Greece. But not into a black hole, but into a process that allows for rebuilding - like Germany did. I would not invest 1 Cent in Greece right now - but if there are greek companies who show they are serious about what they say, that would change. @10236 (Profil gelöscht) The main Greek problem is not the total amount of debt. This has been extended to the point that the Greek interest rates are lower than those of Germany. The problem is poor government and poor fiscal responsibility. To cancel debts now, before reforms, would set a very bad example. @Joe Jones Low interest rates are not helping if you have to pay interest rates in a recessing economy acompanied by austerity measures which are crippling your demand. With the current debt/GDP ratio Greece would have to generate 4% budgetary surplus every year for the next 30-40 years to sustain the possibility of repayment (see IMF paper - not approved by IMF-executive ;). As for "bad example": politics is not the school or paternalisitc family in which you also try to teach a spoiled child how to behave and how to obey the rules. It could be the view of some German/European politicians, but it is surely false. Schäuble is a lawyer so his view of economy is chracterized by this rule-keeping mania. Macroeconomics is for most German politicians and economist looming on the horizon, without really beiing important. Maybe with the China getting into trouble and German econpmy 50%-dependent on export this could begin to change. So - posthumous victory for Varoufakis. But of course politics has to do with setting examples: „pour encourager les autres“. And the rules in question are not trivial conventions, such as which fork to use at dinner, but expressions of the vital interests of states. The Germans and some other European states do not want a transfer union and they are prepared to use their political power to assure that it does not ensue. I consider politics as a realm of conflict and the attempted resolution of such conflicts. The aim of politics is to get others to do what they voluntarily would not otherwise do. Where there is harmony and agreement, there is no politics. So yes, there are political elements in schools and families. "I consider politics as a realm of conflict and the attempted resolution of such conflicts." It was surely not considered in the times when European Union was created and even not two or three decades ago, when the drafts for European currency were made. Rule-obeying may be a good disciplinary measure, but not always the best pragmatic solution. So the core of the disagreement between Syriza government and Mr. Schäuble was the debt cut. The institutions (less the IMF so) led by Mr Schäuble wanted the reforms without debt cut/restructuring leaving Greece with (still) plenty of interest to pay. Greece had plenty of experience in burdening even grea´ter payments (http://www.indexmundi.com/facts/greece/interest-payments) but not in the times when you're on the downhill path of austerity. 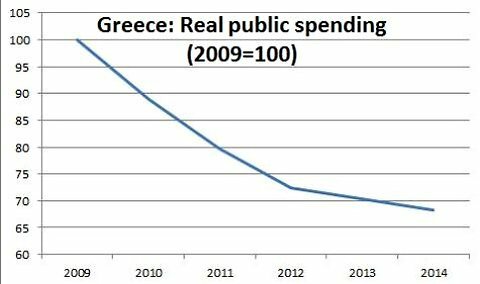 BTW, if Mr. Schäuble and his followers wanted to make an example out of bad Greek fiscal behavior (I'm sure they did), they were free to state it this way. But instead, just to pretend they act according to the ideals of "European spirit", they presented themselves as a saviours in spe of Greek people and their spoiled political entity. What a hypocrisy! I dont think you are right in your statements at all. But, if debt was already cancelled twice, what is the point in doing it again? Your statement is full of contradictions, impractical, and does not solve anything. And Varoufakis won nothing. Not for his people or anyone else. He simply did not have a clue, an das soon as he realized that people knew how incompetent he was, he tokk the asy way out an dran away. "But, if debt was already cancelled twice, what is the point in doing it again? " "And Varoufakis... simply did not have a clue." Well, Mr. Schäuble is a lawyer and Mr Varoufakis an economist. So the competences are pretty clear. As for dealing with economies in trouble: it was Schäuble who negotiated the terms (and the costs) of unification in 1989/1990. With his "expertise" he didn't got a clue about the costs and the future development. "Well, Mr. Schäuble is a lawyer and Mr Varoufakis an economist. So the competences are pretty clear." What does that have to do with the success of what the individuals have achieved? 1989/90: are you saying that the people in the DDR were better of then, than they are now? The DDR was far worse of than anyone possibly could have believed - part of the Communist propaganda, still practised today by Russia etc.